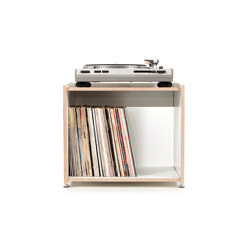 Elegant, minimalistic console table from the QUADRA series. The wooden rack made of solid cherry tree wood with large glass panes made of tempered safety glass turn the console table into the perfect furniture for small and narrow interiors - such as corridors, hallways, walk-through areas. Available with transparent and satinated glass panes. Delicate, space-saving secretary desk made of high-quality cherry wood with a black tabletop. Ideal as a flexible workplace for laptop and tablet, especially suitable for small spaces and multifunctionally used rooms such as hall, living room or bedroom. 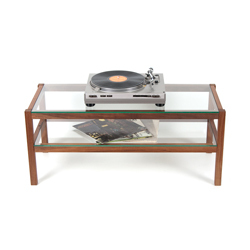 Graceful and straight-cut sideboard for TV-sets, stereo and hifi equipment, record player, dvd player, game console or as a side table or coffee table. The TV-Board is made of solid cherry wood and comes with two large safety glass panes, which provide lots of space for your technical and media equipment. Graceful and straight-cut coffee table. 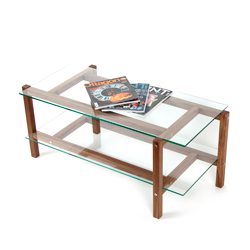 KRUIS is made of solid cherry wood and comes with two large safety glass panes, which provide lots of space for magazines, newspapers, coasters or storage boxes. The offset-placed legs add a special touch by giving the slim, delicate table an asymmetric look. Noble desk made of white birch plywood. Slender design with bevelled side panels and a continuous tabletop. Includes integrated cable hole and matching tray for multiple sockets or power supplies. 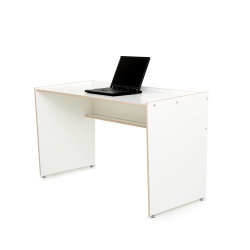 Elegant office container or printer table made of white birch plywood. Slender design with beveled side elements and many thoughtful elements. Includes integrated cable hole and plenty of storage space for printers, scanners, folders, shelves and storage boxes or cartons.